HTC's taken to light teasing on Twitter, giving rival firm Samsung a gentle prod in the funny bone over the Galaxy S5's design. 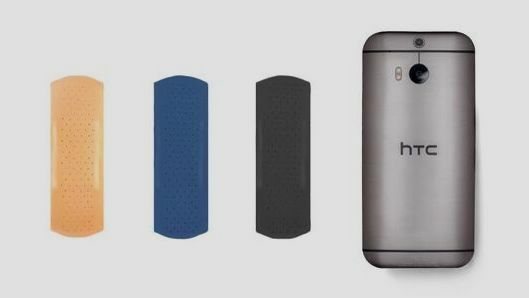 The Taiwanese phone-maker tweeted a picture yesterday showing off the HTC One m8's, with its brushed metal finish, lined up alongside three S5-coloured plasters, riffing on the latest Galaxy phone's dimpled rear. Tough talk pointed at Samsung, who's most recent version of the Galaxy received criticism over its not-so-premium backside. “Our major aims were usability, friendliness and a more humanistic design. We wanted something with a pleasing feel,” said Samsung Senior Product Designer Dong Hum Kim, defending the S5's aesthetic post-launch. “This material was also the best at visually expressing volume, better at symbolizing our design concepts,” he continued. If you're not yet swayed to pick a side, why not take a look at T3's comparison between the HTC One m8 and the Samsung Galaxy S5?